The GSGB September Meeting was played at Kenilworth GC and Little Aston GC. 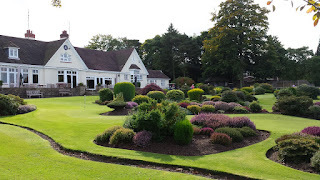 Both are participating clubs and are generally regarded as two of the premier parkland courses in the Midlands. Seventy four members enjoyed two glorious days to finish off another successful season for the Society. This was in stark contrast to our last visit to Little Aston where torrential rain led to the abandonment of the day. The courses were in excellent condition and both had fast, sloping greens to contend with, which possibly explained why fewer 2's than normal were recorded. At Dinner we were joined by the Kenilworth Captain Tony Ranger and his wife Chris. GSGB Chairman Robin Moser presented Tony with a £500 donation towards the club junior section. On Day 2 we were joined by Little Aston Captain Geoff Hands who also received the GSGB donation from the Chairman before presenting the prizes. The men’s Barlow Seniors Trophy was won by Michael Curley from Northamptonshire County with 69 points and the runner-up was Robert Hill from Bath with 67 points. The ladies Trophy was won by Ruth Lindley from Hartlepool who scored 66 points narrowly beating Gillian Curley who also had 66 points. A full list of prize winners can be seen below. This was the last Meeting of the season and although the summer of 2015 has not been particularly memorable on the weather front, the GSGB were lucky to experience good playing conditions for all five events. The opening Meeting of 2016 will be held at West Lancashire and Southport & Ainsdale on May 23rd -24th.